Many colorful decorations can be made with artificial flowers. 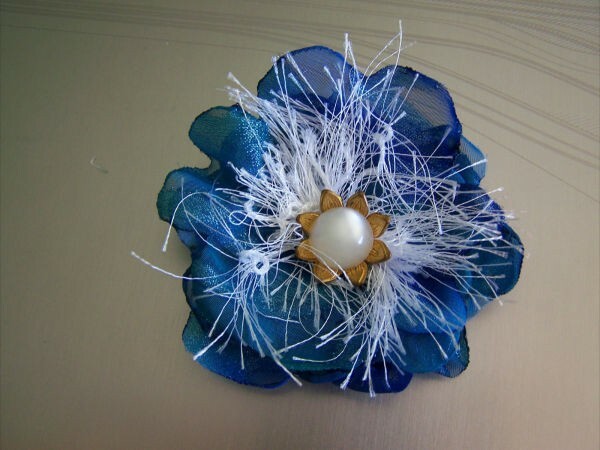 This guide contains crafts using silk flowers. When my kids were little, money was sparse, and we lived way out in the backwoods. There was little, if any, activities we could afford. We did discover one, however, that may sound a little morbid at first, but is actually wonderful. We visited cemeteries. We never removed floral arrangements from a gravesite, and if we could pick up and restore one to its proper place, we did. But at the back or in the woods around the perimeter of most cemeteries, there are usually piles of discarded silk flowers. Many are still beautiful when brought home, washed in the bathtub with some regular washing powder and bleach, and dried. If one is especially pleasing in shape, but faded, there are sprays sold at craft shops to "paint" them colorful again. We disassembled the arrangements first, washed them, and reused cleaned containers, or yard sale vases; perhaps using a jelly jar with a cute grosgrain ribbon, to re-arrange them into beauty again. Maybe a card, pair of socks, pocket comb, a box of bath powder or similar dollar-store item was added. Then we would make a trip to our local nursing homes, assisted living houses, battered women's shelter, or the like, and my children learned to give from the heart, and received such gratitude in return. It was like an Easter-egg hunt in the bushes, a recycling project and art class at home. We also has a Sunday school lesson in the faces who smiled back at us as we shared all we had, and let a "forgotten" person know they were special. And I now have some really special, loving, giving adult children. 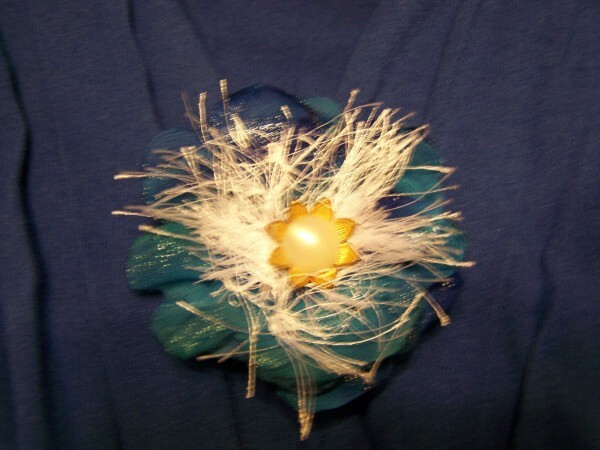 Dress up a simple tee or wear it in your hair, either way they are fun to make and wear. Since you will be using flame this is not a craft for children and please be careful. Have a wet paper towel or small bowl of water close by! I don't intend to scare you I just want you to be careful and safe. These are easy and safe to make, but you must always be careful when using an open flame. You will be melting the edges of the fabric by holding your fabric slightly above the flame. I use a tea candle so it sits low on the work surface. Using the pattern provided, make at least 5 shapes by folding the fabric into 5 layers at one time. Lay the pattern on the fabric and fold the pattern and fabric in half as shown in the photo. 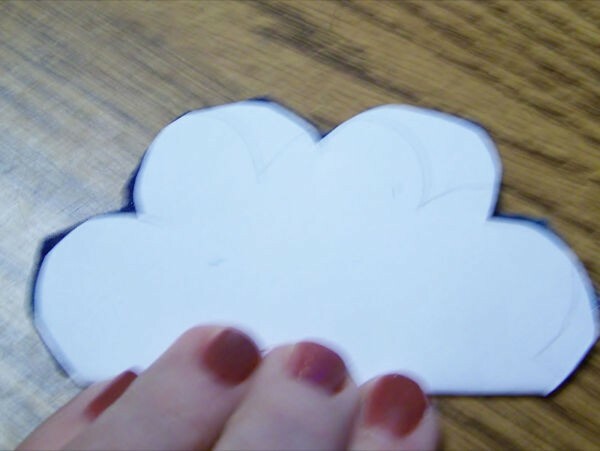 Cut out around the pattern, don't worry about being exact as your edges will not matter. Remove your pattern, but before separating your fabric make a 1/2 inch slice in between every other petal hump through all 5 layers. Separate your layers and doing one layer at a time hold the edges over the flame, start about an inch above and work your way around each petal. Going closer to the flame as needed to singe the edges. Be careful, the edges will be hot for a couple of seconds, you are melting the fabric. When you come to the slit work the flame along the slit, this will make your petals curl. For the top layer I hold the center of my fabric layer over the flame to shrink the whole layer. Repeat for all of your layers. You can either use fancy buttons or a tassel sort of topping. I wrap fancy yarn or ribbon around three fingers 12 to 15 times depending on the material. I slip the loops off and hold them together while I wrap a 6 inch piece of the same material around the middle; tie it off. Then, depending again on the look I want I either cut the loops or leave some and cut some. Arrange your layers so the curls please you, top with a fancy button or your "tassel" and sew through all layers in a small circle to make sure you have a good base. Now cut and fold a piece to hide the stitches on the back from the petal fabric or other sturdy fabric. 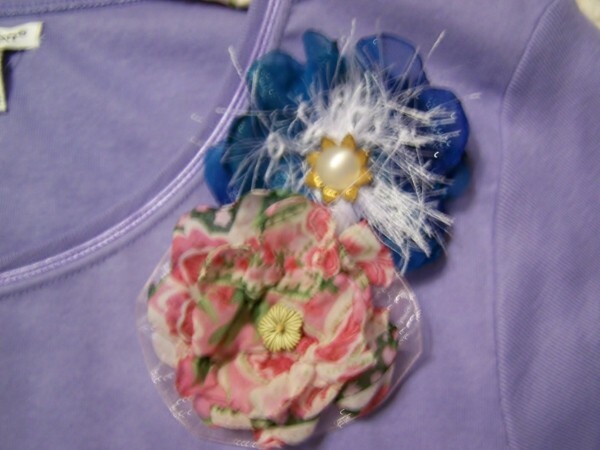 If making your flower into a pin. 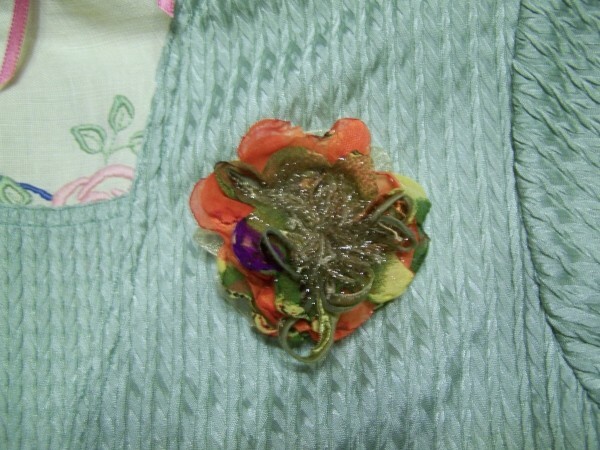 Sew on a pin back and enjoy your synthetic silk flower. 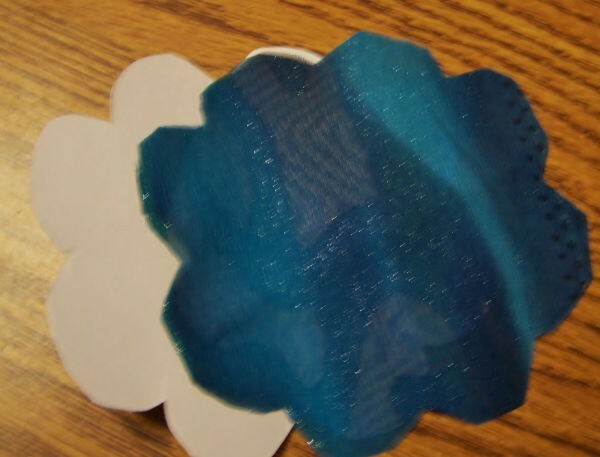 Try mixing different colors of fabric and different shapes of petal patterns for fun. As you can see they can be used in a variety of ways. The red and blue tops were a little too low for wearing to some occasions and the flower makes a pretty solution to that temporary problem. Dress up a plain tee with a grouping around the neck or on one shoulder. They are so light weight you won't know they are there. So cute on a clip in the hair and the little girls especially like having something no one else has as we all know. They are so quick and easy to make you can get 3 five layer flowers from one 1/8 yard of fabric. I found a great variety at JoAnn's Fabrics on sale for half price, that made my flowers around $2.50 each. Take a Styrofoam ball, pull heads off of silk flowers and glue and press into Styrofoam ball. Glue silk leaves from silk flowers throughout ball. Hot glue matching ribbon so you can hang. 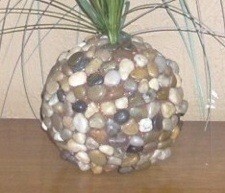 This natural and artistic piece is a great way to add some dimension and class to a room. The round stone base and graceful grass top create a unique planter looking decoration. This craft can be a lot of fun and very complementing to a rooms décor. You can make simple country kitchen designs or something more contemporary and modern. I went to a Tea Room awhile back and used their restroom and when I washed my hands they had this dish with silk flower petals in it that had scented soap that coated them. You used one petal to wash your hands, that was all you needed. Can anyone please tell me how they made these silk soap petals. I would really like to know how to do this. I bought the soap making pack of soap base at Michael's and melted according to instructions. I dismantled my artificial flower blooms and dipped them, then let them dry on wax paper...very easy. and pretty as you say displayed in a bowl. pour soap you can buy at a craft type store. flowers petals you have cut apart into the melted soap. Place on the wax paper to dry. That's it. I live in Abilene, where is this tea shop you are talking about? I'd like to go myself. And if I do, I'll ask them if they can tell me! It sounds really pretty and feminine. I love stuff like that! You don't get to see stuff like that very often. Have a great week! That sounds so lovely! 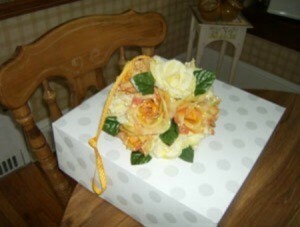 And what a great use for silk flowers that are no longer fresh looking! Thanks! That sounds so cool. It will be a great touch to the bathroom. I am in Brownwood, Texas would love to see something like that. I purchased from the "Dollar Store" a box of decorative soap that looks and appears to be silk flower rose buds. they even had all separate petals and everything but they were actually perfumed bath soaps that you add the petals to your bath. Your post made me think of them.